What’s new at Tommy Bahama, besides your well-deserved vacation at home? New dining delights! Tommy Bahama, where vacation is a way of life, is a-buzzin’ as if it were still summertime here in Laguna-ville. Well, it is touching on 70 degrees in early January, so it may as well be the land of vacation. The bar is lively with a good crowd in the afternoon as I stroll in, and straight on to the dining area. The window-side booths are great for discreet sidewalk people watching but my husband, Richard, and I have arrived with a good post-workout appetite to boot. Who doesn’t love coconut shrimp? No one! In my perfect world, coconut shrimp is as presented at Tommy Bahama – super-sized shrimp with an extra-crispy coating of sizzling sweet coconut paired with zingy papaya-mango chutney. I am a die-hard poke fan. I seriously think the one sorely missing restaurant in Laguna Beach is a poke bar. So I am, admittedly, hard to please on this subject. And I’m happy to report that the Tommy Bahama Ahi Poke Bowl is now my Laguna favorite. What sets this poke apart is the mix of ingredients tucked into sections of the bowl. First, there’s the fresh ahi, diced into nice, little bites – better for melding with the other flavors than most standard big-size chunks found in poke bowls. Sprinkled amidst is a dose of quinoa, sesame seeds, and faro for a healthy and tasty spin added to the classic. Underneath are baby greens, and around the sides: pickled ginger, crispy wontons, edamame, seaweed, avocado slices, and the Tommy Bahama classic “Island Slaw” – all drizzled with a wasabi aioli. This is what I would call a big salad, but with ahi poke as the main event. It’s a big salad I’d be happy to have any day of the week. Another top hit from the new menu – beef Barbacoa Tacos. Richard is the Mexican food fan in the family, so this lit his fire. The tacos are described as “Cajun-Seasoned.” I was there to weigh in on the quality component – and, again, happy to report thumbs up. I like that the flavorful beef is so tender it’s fall-off-the-bone, and melt-in-your-mouth rich in the seasoning. The barbacoa is nestled in two crispy flour tortillas with a tomato relish, Island Slaw, and lime sour cream. On the side are house-made tortilla chips and fire-roasted salsa. Just when we thought we could not possibly eat another thing, along comes a tempting teaser. The ever-popular Key Lime Pie has been tweaked in the new menu – transformed, in that vacation-casual way, into a popsicle. Key Lime Pie (only made with authentic Key limes), that sweet and tart little tramp! Now she’s been dressed up in dark chocolate, turned into a pop, and looks all the better for it. Our server tells us that lots of people pick the whole thing up by the stick and enjoy it bite by bite that way, but since we were splitting, we opted for cutting up bite-sized bits of the luscious chocolate and tangy sweet. Tommy Bahama’s Chef Stephen Nguyen trained in Newport and is now happy to call the Laguna locale home. The Tommy Bahama formula has standard menu basics anchored in their 15 locations around the country, but Chef Stephen has created regional spin-offs for the Laguna Beach home, often featured in their daily specials. One big event on Chef Stephen’s agenda this week is New Year’s. There’s going to be a “New Celebration” menu created just for New Year’s Eve as well as New Year’s Day. The New Year’s Eve last seating is at 10 p.m. Details not available at press time, but phone for reservations at (949) 376-6886. This was quite the holiday treat of a lunch. Delicious, and no holds barred! But I’ll return after New Year’s diet resolutions just for that poke bowl. Check out the new menu at Tommy Bahama; it’s a treat for their chef’s selections plus you get the added benefit of enjoying this corner of Laguna that hosts a relaxed, vacation vibe. The minute I open the door of Taverna, savory fragrances envelop me in haze of memories. I’m immediately taken back to an incredible pasta dish I had in Venice 34 years ago. A long time, I know. Such odor/memory links are known as the “Proust Phenomenon” in honor of Marcel Proust, the French writer who spoke lyrically about the strength of memories evoked by smell, and never has this sensation been more evident to me. But this isn’t Italy, this is Laguna Beach, and my husband Ron and I are in for a treat that exceeds the café in Venice. Our palates just don’t know it yet. Steven, the general manager, greets us, and we decide to sit inside. Our server Mike, who has been with Taverna since July of 2017, knows quite a lot about the restaurant. It resides in the restored Laguna Federal Savings and Loan Building, and the three unique murals (from the 1940s) in the patio area were uncovered during the renovation. Taverna is part of Lombardi’s Family Concepts, which is headquartered in Dallas, and this is their first restaurant in California (it opened in March of 2016). They have additional locations in Las Vegas, Austin, Houston, and Akumal, MX. Specializing in Northern Italian cuisine, each restaurant creates its own dishes from scratch. Mike tells us about the specials for the day. For once, I realize I’m not straining to hear what the server is saying. One of my pet peeves is the high noise level in some restaurants, but that is absent here, and Mike points out the many sound absorbers installed on the beamed ceiling. One of the dishes he mentions is Scallop Risotto, and since Taverna is known as a “risotteria,” and it appears to be a signature dish, Ron decides on that one. Their expertise in risotto is widespread, they use only Carnaroli grain, which maintains its shape during the slow cooking process that produces enviable risotto. And just because I love eggplant, I order the Eggplant Parmigiana. Mike brings each of us a glass of wine, Pinot Noir for Ron, and a Sauvignon Blanc for me, and turns out, each is an apt pairing for our selections. Because the servings are ample, we decide to split a Burrata Salad, which was exactly the right choice. If I wasn’t aware that Taverna doesn’t have a farm out their back door, I would have guessed the tomatoes, arugula, and basil were directly from backyard farm to table. Rarely have I tasted salad ingredients so fresh and full of taste. And I don’t even know what to say about the Burrata, (obviously, they don’t have a cow anywhere nearby either). Burrata means “butter” in Italian, and this offering was fresh cheese at its best, creamy and rich. To accompany it, they present a basket of warm rosemary bread and a crock of spread made from garbanzo beans, pesto, pine nuts, garlic and basil. A delicious and unexpected blend of Greek and Italian. And, of course, the traditional balsamic vinegar and olive oil, but taken up several notches. It’s no fluke that Taverna is known as a “risotteria.” The Scallop Risotto is a dish to die for – or to die after – since this might be a good choice for my last meal (if I knew ahead of time it was to be my last meal). Although I loved my Eggplant Parmigiana, I commandeered a considerable amount of Ron’s dinner. Not only were the scallops cooked to perfection, silky and tender, but the asparagus shavings gave the dish a nice crunch. The risotto, as sublime and skillful as it gets, was smooth and laced with nutty parmesan, just enough to complement the other ingredients. Each bite was a tapestry of flavors. The Eggplant Parmigiana was the best I’ve tasted, a tower of meaty eggplant slices, layered with, but not overpowered by a superb sauce. It was accompanied by a side of pasta with Pomodoro sauce which was also wonderful. At this point, anyone else would turn down dessert, but not us. At Mike’s suggestion, we order the Chocolate Hazelnut Budino, which he describes as a chocolate lava cake, but it’s so much more. It’s topped with a giandula sauce, whipped cream and vanilla gelato. The crispy edges of the cake and its fudgy center, combined with the gelato, is more than any chocolate lover could ever hope for. No matter how amazing the food is, the server can either make or break a dining experience, and Mike made the evening an extremely pleasurable one. He was welcoming and gracious, answering all our many questions about the restaurant and the food with patience and expertise. To cap off the dinner, Steven brings us a glass of Limoncello, and we all toast the New Year. This night couldn’t have been a better introduction to 2018. The memory of that long-ago pasta meal in Venice has now been upstaged by the food experience we had at Taverna. And, for us, traveling to Laguna Beach (rather than Italy) doesn’t require planes, trains, or even automobiles. Well, maybe sometimes automobiles. And I have to agree with my husband. Just this one time. Taverna is located at 222 Ocean Ave., 949-715-0821. CENTRAL Laguna Beach, an upscale, American New Fusion restaurant on Forest Ave, suffered an afternoon fire that severely damaged the property on Fri, Dec 29, three days before New Year’s Eve. Investigators determined the fire was an accident and nobody was injured. Over the past two years, CENTRAL has entertained a steady stream of Laguna Beach locals, tourists and a host of celebrities and other notables including Doug McLaughlin, Founder of Nobleman Magazine. The space has also been filmed as a location on the Real Housewives of Orange County. The visionary team at CENTRAL is using this as an opportunity to take feedback from the local Laguna Beach community and enhance the overall experience to create a custom restaurant built with input from regulars – hopeful to make the wish list items for their favorite restaurant come true. With a mountain to climb the team at CENTRAL remains positive and is scheduled to re-open to the public the week of Feb 26. For more information, visit www.centrallagunabeach.com. As someone who likes to cook with fresh ingredients and who avoids processed foods like the plague, I tend to steer clear of take out. That said, I’m only human, and, like most people, the idea of preparing even a simple meal at the end of a trying day can be daunting. Enter La Sirena Grill in South Laguna. Open daily, they are my perpetual back-up plan for a guaranteed healthy and tasty dinner. La Sirena, the self-proclaimed “Mexeco” eatery, prides itself on organic, sustainable and responsibly sourced ingredients. They even have a page on their website describing where they obtain their meats and veggies and providing links to some of the purveyors. I know that when I order the blackened salmon, for example, it is either fresh and wild caught in season or wild caught and frozen at sea in the off season. Just as important, it is delicious. Casual queries to other locals about La Sirena, revealed a number of like-minded souls. 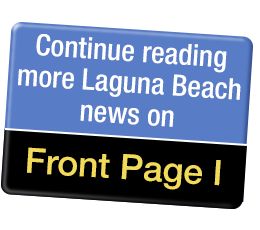 Angela LaVelle, Laguna resident and owner of the recently opened Dog Tub on Coast Highway, said that it is also her go-to place when she doesn’t feel like cooking. As a vegetarian, she raved about the veggie burritos, “so flavorful and filling,” and her “favorite” green enchilada sauce. But don’t get the idea that take out is the only way to enjoy La Sirena. Angela likes to go for a sit-down experience at one of the outdoor tables with her Husky, Kona. “There’s such a friendly vibe,” agreed local Lisa Childers, manager of Laguna Beach Books, who is often accompanied by her Labradoodle, Bindi. She prizes the calamari tacos (not technically a menu item, just ask for them), and the Spicy Chicken Tortilla Soup. When you’re under the weather, “that is the soup to get,” she said. I have to agree. It’s just the right amount of spicy, with a deep rich broth strewn with sweet peppers and juicy hunks of chicken. Sprinkle on the crispy tortilla strips and shredded jack cheese and you have a nice little bowl of comfort food nirvana. For me, the dog-friendly patio is heaven-sent on a hot day when I have my two dogs with me and can’t leave them in the car. At the same time, after a long day of packing boxes and moving furniture for a temporary move, my husband and I were so grateful to sink our tired selves onto a couple of stools at the bar inside. I felt the stress of the day fade away as we ordered some chips and that beautifully thick guac to start, followed by a couple of baja fish tacos (crispy fish, fresh cabbage, handmade corn tortillas and tangy sauce, need I say more?). The most difficult decision was choosing from the 20 craft beers on tap. That’s right, count ‘em, 20 craft beers on rotating taps. When keg is drained a different beer takes its place, so there’s almost always something new to try, and something for every palate. Lager? Check. IPA? Check. Stout? Check. Not sure if that new sour beer is your thing? No problem, they’ll give you a taste before you order. Or if you really can’t decide, go for a flight of four-ounce pours. What? I know! Of course, there are other decisions to make. I mean, maybe you’d like to start off with one of their signature margaritas, after you’ve figured out who’s driving. Spicy mango, perhaps? Wine is another option, and with Tablas Creek wine on tap, that is a very enticing option, indeed. Not in the mood for booze? Quench your thirst with an agua fresca, horchata (organic milk, of course), soda, lemonade or iced tea. When it comes to the food, find your own bliss. My husband often goes for a burrito, with carne asada or carnitas, depending on his mood. Sometimes he’ll pick an item on the daily specials board, which offers up tasty treats pretty regularly, including a very respectable jalapeno burger. Some people swear by the taquitos, or the enchiladas with red sauce. Others can’t get enough of the tortas. I admit that the killer lime-cilantro dressing on the salads is so good that I often order extra to take home and use during the week. The Blackened Wild Salmon Salad is definitely a favorite of many customers, myself included. It’s packed with fresh greens, crispy sliced veggies, avocado, and a papaya salsa that pairs wonderfully with the spicy fish. And yet…the crispy onions that top the Avocado Lime Salad often beckon. Fortunately, the folks at La Sirena are amenable to mash ups and will pair it with the salmon, upon request. When in doubt, or indecision, ask (remember those calamari tacos?). From dyed-in-the-wool vegetarians to hard-core carnivores, and from gourmets to gourmands, La Sirena has something for everyone. I bring all of my out-of-town guests there, and they all crave it for different reasons. For my nephew, it’s that salad dressing. For my brother-in-law, it’s the blackened salmon burrito. Lisa Childers says that whenever her daughter-in-law visits from Israel, it’s her first food stop in Laguna. If you hit La Sirena on a Friday night, you may notice a lot of families at the outdoor tables, parents happily chilling as kids romp safely in the enclosed patio area. Did I mention that the menu includes some great kid options? If you go on a Monday night right about now, there will be football on the screen above the bar. Any day of the week, at any hour, those of us who are slaves to our four-legged family members love to hang on the patio with our furry companions. La Sirena Grill South Laguna is open daily from 8 a.m. to 10 p.m. at 30862 S. Coast Hwy in the Gelson’s shopping center across from the Montage. Yes, they are open for breakfast. Does it get any better? La Sirena Grill also has locations at 347 Mermaid Street in downtown Laguna Beach (its original namesake location) and in Irvine. Visit www.lasirenagrill.com for details, menus and contact info. It’s a hoppin’ busy afternoon at Kitchen in the Canyon when I joined a friend for lunch – and met the owner, Patrick DiGiacomo. While he finished up some business with the kitchen staff and construction workers out front (they’re tending to repairs and fix-its on the Canyon complex, now under new ownership – the place is already looking better for it), we perused the menu. And the chalkboard specials. And the cooking classes schedule. And the catering menu (PT Culinary). This is indeed a multi-faceted operation! The first difficult decision was a drink selection. Daily, the Kitchen offers a variety of fresh fruit waters, and some of the best (Kean) coffee around. They also have a nice iced tea, my go-to selection when I’m out and about. Ordering at the counter it’s easy to get a nice view into the incredible kitchen just beyond the glass. There, Patrick and his staff work their magic and often give classes for their home-chef teaching program. “It’s a great way for corporate team building,” Patrick tells me. Some of his corporate clients include Pfizer, Ford, and Mazda. He’s also proud to be the “only place left” with five stars on Yelp. The reason this place attracts so many people is not only because of the food, the convenient location, the event-friendly space, and the gleaming stainless steel, clean white kitchen. It’s Patrick who’s the heart and soul, putting it all into chefdom and into helping others. Once upon a time, Patrick DiGiacomo was a corporate guy himself. After 30 years as a successful financial planner, he decided to pursue another passion. He enrolled in the chef’s school at Laguna Culinary, which had been located in this exact same spot. After graduating in 2008, he took that passion for cooking and added his desire to serve with purpose. He went to Orange County Rescue Mission homeless shelter and, as a volunteer, became head chef, working 3-4 nights a week for four years. In addition to his work at OC Recue Mission, he volunteered at St. James Episcopal Church, and managed to launch his own catering business and chef teaching program. When the space in the Canyon became available, the chef set his sights on the café concept, including job training and opportunities for some of the indigent and homeless population. He now calls Laguna Beach home, and he feels the love. “Laguna Beach has such a sense of community,” he gushes. Kitchen in the Canyon hosts many local events in their side room, such as the Laguna Beach Business Club and the Festival of Arts Christmas party, and a bi-weekly support group for moms of autistic children. The café offers discounts to artists, and LCAD staff and students. This all makes for a continually lively atmosphere. Breakfast is highlighted by such favorites as Avocado Toast, the Breakfast Burrito, and Steel Cut Oats Brulee (which should always be accompanied by their perfectly crafted cappuccino). Me and my pal, Leslie, were hungry for lunch and we wanted to try something tried and true, and something new: the most-popular “The Canyon” salad, and the new addition to the menu, “The Clubhouse” sandwich. The Canyon salad is made with arugula, pickled red onion, pear, orange segments, candied pecans, Gorgonzola cheese and sweet basil tarragon vinaigrette. It’s a simply tangy and divine salad taken over the top with the added grilled steak option. The Clubhouse is made with roasted all natural turkey, avocado spread, green leaf lettuce, roasted tomatoes and chipotle mayo on a ciabatta roll. The two dishes were wonderful, and really big sized. We would have taken some home except that it was just too delicious. The Kitchen in the Canyon is open just for breakfast and lunch, but chef has plans for doing “pop up” dinners soon – with guest chefs and wine pairings. He tells us that there will be one sitting for about 30-35 people. “That could be so fun!” he says, enthusiastically. Information, reservations, and cooking class info can be found on their website: www.kitcheninthecanyon.com. One of the delightful newer additions to Laguna’s dining scene is the Vietnamese café, Another Kind. Located in the canyon, between the Sawdust and LCAD’s south campus, the place attracts a clientele that is artsy, academic and, get this – vintage car enthusiasts. This self-described “Crossed-Culture Canteen” is a local’s shop, owned by Thinh and Vy Nguyen. Helping out is Vy’s sister, Vy Quan, and she described some of her favorite things that make Another Kind unique. While she walked me through some of the amazing dishes, she also raved about driving. Yes, she’s the reason for the vintage car aspect. There is a gathering at Another Kind early every third Saturday of the month, of classic car fans. Vy Quan is not only passionate about the food prepared by her family, she’s also nuts for cars. She divides her time; waiting on tables one minute, and studying to be an auto mechanic the next. “I covet Steve McQueen’s Porsche!” she says with a big smile. The classic car group comes in to enjoy the specialty coffees and chai, and perhaps a bowl of Pho (chicken or beef served with fresh basil, sprouts, chili, lime, and chili sauce). I remember Vy Quan, as she was at LBHS in the same class as my son. She was in the dance program for many years. At Another Kind, her sister and brother-in-law oversee the business, and the family lends a hand. Her mom’s recipes rule the roost. The café opened in October of 2016, and is styled with funky, vintage school chairs, tables and decor. It’s interesting to watch the food preparation at Another Kind because Vietnamese food is nothing if not labor intensive. There are a lot of ingredients, and lots of chopping involved. There’s always the scent of lemongrass in the air. …And now, a few menu favorites to mention, beginning with their classic spring rolls. The Cha Gio is a fried spring roll prepared with shrimp, minced pork, carrot, shallot, jicama, and wood ear mushroom. It’s served with a lightly spicy sauce. This could surely be a meal in itself. On the side I totally enjoyed the Sai Thanh Slaw, a tangy and citrusy-sweet salad of finely minced red and white cabbage, onion, peanuts, fried shallots and fresh mint. Special no. 3, the Bun Cha Ca, is one of their most popular dishes, and I’ve had it every time I go. It’s fantastic – but, of course, you must allow time for the preparation. It’s made with turmeric marinated white fish, pan seared, and served over rice noodles with sautéed scallion, baby dill, mint, red onion, mixed greens and peanuts. The newest menu item is now my newest favorite, Grilled Lemongrass Chicken. (All their poultry comes from Mary’s, organic and free-range.) The chicken is marinated with lemongrass, then grilled and served with jasmine rice, and Another Kind’s home made citrus garlic chili sauce on the side. For a sweet finish, there’s the Chilled Organic Coconut Pudding. I love how it’s served on a vintage metal tray, adding to its appeal. This family-run and family friendly café is a treat, first time and every time. We’re really happy this complex of shops and restaurants is improving in many ways, under its new ownership. And we’re extra happy that this local-run café has brought the authentic flavors of Vietnam to Laguna. No matter where you live in Laguna, there is a Happy Hour within walking distance; North, The Village, and South, each with titillating libations and swoon-worthy fare. The Huffington Post says, “Happy Hour is a euphemism for that secret and festive hour.” I don’t know how secretive Happy Hours are (and we don’t want them to be), but the three we visited—Royal Hawaiian, Lumberyard, and Wine Gallery—were all festive, but distinct. Same town, different vibes. In North Laguna, Royal Hawaiian, which marked its 70th anniversary the end of last year, hails the return of the “Aloha hour.” And they make the most of it. One of the advantages of their Happy Hour is that it starts earlier than most, from 2:30-5:30 p.m., Wednesday-Sunday. An obvious invitation to make the most of the lazy afternoon hours. The island décor transports one to the “Lei’d” back hours, soothing and mellow enough to relax tourists and locals alike. The afternoon Lynette and I visited, patrons trickled in, and slowly began to populate the seats. To begin, Lynette sampled the Western Sour (with the prerequisite umbrella, orchid and pineapple chunk), an almost-forgotten classic with bourbon, falernum, and lime juice. She said it was delicious and not too sweet. My sauvignon blanc was fruity and very cold, which always gets kudos from me. Drink prices during Happy Hour are $3 off tropical drinks and $2 off house wines, beer and well spirits. Glenn served up a combination of four appetizers, a bargain at $28; Ahi Tuna Poke, Shrimp & Scallop Spring Rolls, Coconut Shrimp, and Smoked Salmon Flatbread. The Ahi Tuna Poke was some of the best I’ve had (Lynette concurred), the papaya added just the right amount of sweetness to the silky Ahi, clean and fresh, and the Ponzu sauce and won tons were a superb accompaniment. A twist on traditional, the coconut shrimp wasn’t breaded, but coated with coconut, crispy but not overwhelming. The spring rolls, served with a lovely papaya rice vinegar sauce, were crunchy without being oily. And the smoky salmon was served on a thicker than usual herb-crusted flatbread, which was a great foundation for the cream cheese, capers, and chives. Creamy and salty, what goes together better? As we feasted, Glenn filled us in on what’s happening at their Happy Hour. They’ve upped their mixology game with a bar consultant and incorporated a more Asian (Pacific Rim, Chinese and Japanese) inspired menu. The Hoisin ribs, with house BBQ sauce, are the most popular item on the Happy Hour menu. And they are soon to have a new draw for locals and visitors alike. A tiki torch-lit patio in front will be open for business, a great stopping place for locals taking an afternoon walk. As the sea gull flies, The Lumberyard is only 0.6 miles from the Royal Hawaiian and right smack dab in the middle of the village and action, especially during the Art Festival. During the summer, if one is attending the FOA or the Pageant on a weekday, this is the ideal spot to fuel up at Happy Hour before heading over to the Festival grounds. The Lumberyard’s bar (the Happy Hour menu is available only at the bar) is a cozy and comfortable atmosphere with San Francisco cocktail bar vibes (and flat screen televisions). Happy Hour is offered Monday through Friday from 3:30-5:30 p.m. with $6 well drinks, chardonnay, cabernet & champagne, $4-$10 appetizers, salads and small plates, $5 draft beers, and $8 specialty cocktails. The Lumberyard is housed in a charming historic building, and its fare is described as American dishes with a contemporary flair. And the Happy Hour plates reflect this mastery. I love zucchini, and The Lumberyard Planks presents it in the best possible way, panko crusted and without the grease and sometimes mushy texture of cooked zucchini. With a dip into the lemon aioli, every bite is perfect. We decided to stick with wine and ordered the house chardonnay, which was a nice choice for Happy Hour. Lynette raved about the Lamb Meatballs, ample orbs mixed with rice, cumin and parsley, atop cauliflower puree. “These are fantastic,” she said, scooping up a little puree with each bite. Although based on Lynette’s compliments, I would have thought the meatballs were the most popular item, our waiter said that the most ordered dish during Happy Hour is the BBQ Pork Sliders. Heading down south, the atmosphere at the Wine Gallery is cozy and inviting with a focus on satisfying wine aficionados as well as foodies. Not only does Wine Gallery succeed in pleasing the palates of their patrons, it also displays a selection of art pieces on its walls to please the eye. It’s not called Wine Gallery for nothing. “We are excited to bring our depth of knowledge and passion for great wine and food to Laguna Beach. Our goal is to give locals and visitors alike a place to relax and enjoy the area’s one-of-a-kind charm in a warm and comfortable setting,” states Wine Gallery. And they achieved their vision. Seating areas (a long table on one side and secluded more private tables on the left) surround the bar, which anchors the inviting space. Chris Olsen, the co-founder/owner, is a warm and gracious host and makes sure he gets around to all the tables to see how everyone is doing. Casey, our server, was welcoming and attentive. On this outing, Marrie Stone joined me. Although we’re close friends, in some areas of food we differ. I’m a vegetarian and she is a serious carnivore. She orders the meatballs and red wine, and I order the cheese pizza and white wine (but I did steal some of her French fries, not on the Happy Hour menu, and she wanted to steal the picture behind us on the wall). Winter Happy Hours are Monday-Saturday (an advantage since it goes through Sat) from 5-7 p.m. Chris explains that the hours are going to change and Happy Hour will soon run from 4:30-6 p.m. The menu includes: $2 off all wines by the glass, $8 keg wines red & white, $5 Pilsner on draft, $8 Margherita & Calabrese Pizzas, 1/2 off pizza of the Day, $5 Off Oven Roasted Meatballs and WG Burger. I had the Henri Bourgeois Sancerre Sauvignon Blanc, and it was crisp, fruity and wonderful! The Oven Roasted Meatballs are wood-fired with a red wine tomato sauce and made with mozzarella, parmesan, and served with the house bread. Marrie described them as, “spicy and awesome,” with more than enough sauce for bread sopping. My Margherita pizza was heavenly, thin-crusted with house made mozzarella, organic tomato sauce, basil, tomato, olive oil, and The Wine Gallery offers full size pizzas for Happy Hour, enough for two (or one very hungry person). This appears to be a place locals and visitors have taken to heart. Although Marrie and I arrived on a Wednesday just after 5 p.m., and were some of the first customers for Happy Hour, when we left, the restaurant was filled with a lively crowd, clearly enjoying all the Wine Gallery offers. No matter what your mood, food hankerings or libation desires, this trio of Happy Hours has it all. It’s just a matter of which part of town strikes your fancy. The Royal Hawaiian, 331 N Coast Hwy, www.royalhawaiianlb.com, 949-715-1470. The Lumberyard, 384 Forest, www.LBLumberyard.com, 949-715-3900. The Wine Gallery, 1833 S Coast Hwy, #110, www.winegallerylaguna.com, 949-715-8744. I remember vividly the first time I saw the Five Crowns, part of Lawry’s, an upscale gourmet restaurant chain, in Corona Del Mar. It was our first family vacation to California in 2012. As Brits, our eyes are always drawn to anything representing the UK and as we approached the mock Tudor building with the red telephone box outside, I remember thinking “oh, it’s the American take on a British pub,” and I kind of dismissed it. When we eventually moved to California two years later it was the last place I wanted to go, I wanted to eat Americana, Mexican and anything other than the type of food I had lived on my whole life, and honestly? I didn’t think anyone could ever cook British food as well as the Brits. About 12 months after we moved here, I was actually craving what we Brits call “The Pub” and my husband Jonathan (also British) suggested we visit the Five Crowns. Hesitant, I agreed, and from that first meal I became hooked. When you walk into the Sidebar, which is a separate eating area, where more smaller plates and a bar menu is served (I will be reviewing this at a later date) you are automatically transferred to a very accurate representation of a good old-fashioned Pub. The décor, the lighting, the atmosphere makes you feel you have just stepped inside from a blustery rainy walk in 30 degrees F to a warm cozy place complete with a fireplace to warm your Wellington boots, when in fact, you have just driven down PCH with your top down in 80 degrees listening to Tu Pac, but you get what I’m saying. It’s like going home for me and that is why I am such a fan, but that’s not the only reason. As many of you loyal readers know, I am limited with regard to food reports nowadays for health reasons, but when I met with Shaena and she suggested someone review Five Crowns, I immediately volunteered. We rarely review for Laguna Beach beyond Laguna Beach. However Five Crowns was our darling Stu’s favorite place to eat, he was the prime rib guy and I know he would have loved that we have featured it. I took Jonathan with me for the purpose of this report (how could I not) and we arrived there on Tuesday February 13 the day before Valentine’s Day, but still tables were as full as if it were the night itself. Andrew Germann, the restaurant manager, greeted and seated us and explained that Valentine’s week is busy for them, not just the night itself, so I was very grateful we were able to dine that evening. Andrew has been at Five Crowns for 18 months now, moving here from Oahu where he was a manager in the restaurant industry. Our server was an amazing young lady called Linda, who literally knew everything about everything, she was funny, warm and attentive and I can honestly say in my years of food reporting, I’ve never had a server as knowledgeable about her food as she. It made the evening flow along so nicely and her recommendations were spot on. She was assisted by the lovely Juan who made sure our iced water kept coming. What I love about Five Crowns is that the menu is not “overwhelming” – as a reporter I honestly don’t enjoy seven-page menus. I’d rather have a one page full of outstanding dishes to choose from. The meal started with their selections of warm breads, which came with a side of traditional English butter, served with some rock salt. A perfect start, along with a cold glass of Kim Crawford Rose for me. We then ordered a salad to share from the Soups and Greens section of the menu. The salad we chose was the Pride Of The Crowns salad, butter lettuce, with bacon, toasted walnuts, shavings of gruyere cheese and herb de Provence dressing. This was simple and delicious. We enjoyed every bite. The butter lettuce smelled and tasted so fresh and the dressing was just right. It was then onto then mains and to my surprise, I’m joking – it wasn’t a surprise at all - Jonathan went for the Crown Cut prime ribs – this dish originates from 1965 and it was the dish that launched Lawry’s fame. The prime rib is served with au jus, a Yorkshire pudding and creamed horseradish. You can choose two sides with this dish. Jonathan went for Lawry’s creamed spinach and the mashed potato. Jonathan hails from Lancashire, which is very close to Yorkshire. And one thing he is very picky about is Yorkshire Pudding. Chef Alejandra has them perfected, very authentic, very well done, light, fluffy and not greasy. This whole dish was fabulous. I chose to go for the Mediterranean seabass, this was accompanied by white beans and prosciutto and served with a butternut squash puree. I couldn’t help myself, I also ordered truffle fries as a side to accompany it. It was an exquisite meal. Tasty but light on my tummy and I didn’t leave a bit. Feeling very full, but knowing I had to try a dessert, I took the opportunity to rest and have a talk with the Chef Alejandra Padilla. Alejandra has been at the Five Crowns for just over three months and is loving it. She has been a chef for 15 years, previously with the Houston group. Her favorite dish on the menu right now is the Beet and Citrus Salad as it reflects the season beautifully. She and her purveyors select the best ingredients for the menu based on seasons. As always, I like to ask my chefs little bonus questions. I asked Alejandra if she was stuck on a desert island with the ability to fish, what would be the five ingredients she would take with her. Her answers were salt, lemon, chilli arbol, rice and squash. Squash features heavily in her menu right now, so I expected that one. The chef was great, chatty interesting and we spent a long time talking about British pub favorites. Who knows? Maybe our ideas will feature on a menu in the future! For dessert we allowed Linda to choose for us and we had a magnificent dark chocolate soufflé with cream and a side of vanilla ice cream. It was the best soufflé I’ve ever had in my life. Perfect in every way. Just as the button was about to pop off my pants we were presented with another dessert, warm sticky toffee pudding with persimmons. This was spectacular, but I couldn’t eat it all. However the Bucklings took a piece to school the following day. I absolutely adore the Five Crowns, they really do have everything right. The food, the building, the staff, it’s all fabulous. All they need is a big grey rain cloud over the entire building ten months of the year and they will be the most authentic British restaurant in the OC! Five Crowns is located at 3801 Pacific Coast Highway, Corona del Mar. Phone number: 949-760-0331. Menu: www.lawrysonline.com. There is much to be said for ambience, for walking into a warm, softly lit space on a chilly evening and feeling the stresses of work and the world begin to melt away. This was my sensation upon entering the well-enclosed patio of Maro Wood Grill on a recent evening. Since most of Maro’s seating is on the terrace in front of the restaurant, my friend and I had brought layers, fearing a chill. We needn’t have worried. Thanks to efficient heat lamps and an absence of any drafts, a lovely warm glow enveloped us and the other diners. No one needed to shift seats because of an overbearing heat lamp or a cool air current. We might have opted to sit inside, perhaps at the small bar offering front row seats to the grill, with its glowing red embers of charcoal and mesquite, where most of the food is cooked. But we opted instead for the magical glow of the patio. Here the background music filled the gaps in our conversation without overwhelming it, and the intimacy of the space encouraged the exchange of a few casual observations with nearby diners, who seemed as delighted as we were to find this haven. If the atmosphere enticed us, the food kept us enthralled. What’s amazing is that even though most cooked menu items are grilled, and even though the grill is plain sight, the only place you encounter smoke is in the delicate flavor it imparts to the dishes. Rest assured, you will not leave Maro smelling as though you’ve been sitting around a campfire. However, from the first juicy bite of a sweet-smoky grilled green bean, you will know that the cook is, indeed, playing with fire. Yes, I used the adjective juicy to describe a green bean. Somehow the flames lick the beans enough to char them and seal in the moisture, rather than drying them out. The crunch came not from an overly crisped bean, but rather from a wonderfully fruity salt. That would be Sonoma coarse sea salt, according to Alex (who preferred not to give his last name) who has owned Maro Wood Grill with his partner Chris since last May (the restaurant has been in operation for eight years). Alex informed us that their aim is to provide an organic, farm-to-table menu with grass-fed beef and other sustainable proteins and, as much as possible, locally sourced ingredients. Hence this ethereal Sonoma, California sea salt. That said, quality rules, which is why the organic wines on the menu are Italian. According to Alex, they tried to find organic wines from California and Argentina (since the menu is loosely based on Argentinian cooking principles), but ultimately the Italian organic wines most closely met the flavor profile they were seeking to match their menu. A sampler plate of the grilled vegetables followed (usually they are separate menu items), and we made quick work of the (aforementioned) green beans, shishito peppers, mini bell peppers and okra, often forgetting to swipe them in tasty a trio of horseradish, sriracha and ginger aioli. Honestly, those mesquite-kissed vegetables were fruity, smoky, juicy and so full of their own natural flavors that the sauces were almost an extravagance. If you’re in the mood for leafier greens, Maro offers a number of substantial salads that could easily be shared as a side or serve as a first course or a light meal. The couple next to us, visiting from Sweden, said they’d had their fill of meat earlier in the day, so they started with an assortment of empanadas (I mean, if you haven’t tried them, it’s almost an imperative), and then finished with a duo of salads – one with burrata, tomatoes, beets, micro arugula and truffled balsamic vinaigrette, and another with kale, carrots, candied walnuts and house pomegranate dressing. Beef, pork, lamb, seasonal fish and poultry are all accounted for in the proteins offered for entrees. For this meal my friend and I shared a seared ahi tuna and a grilled rib eye steak. You will find steak and tuna at myriad restaurants in Southern California, but will they be this fresh? Will they play with smoke and fire just enough to sear their outsides, leaving their insides rosy red? More important, will you be this glad that the other components of the dish complement, rather than mask the innate flavors of the beef and tuna? You owe it to yourself to find out. Maro’s signature empanadas are crusty on the outside and moist and flavorful on the inside - to dip or not, that is the question! And what were those julienned vegetables with the tuna that looked a bit like peppers and onions, but were earthy as well as sweet and velvety rather than shiny and slick? That would be rutabagas, turnips and parsnips, said Alex, solving the mystery for us. “That’s how we turn ugly into beautiful,” he said, referring to the trio of root vegetables as they appear in their natural, rather hoary state. A bright, housemade chimichurri provided an herbal and acidic counterpoint to the rich, but lean rib eye, and grilled mushrooms and asparagus complemented its grassy profile. At Maro, the meat provides its own decadence, no need for extravagant sauces. A lovely Argentinian Malbec, however, paired quite nicely with the beef. Admittedly, dessert was not really on our radar by this time, but when faced with a surprisingly light and decidedly not too sweet lemon meringue pie, we rallied. This is not your grandmother’s lemon meringue pie. No gummy, dense neon yellow layer of overly sweetened lemon, and no dense, almost springy meringue on top. Here was a delicate crust smeared with a layer of lemony custard and topped with pillows of barely set meringue. Oh, and did I mention that your well-behaved dogs can join you on the patio if they are joining your party for the evening? Maro Wood Grill, located at 1915 S. Coast Hwy, is open from noon to 9 p.m. Tuesday through Thursday and Sunday, and from noon to 10 p.m. Friday and Saturday. It is closed Mondays. For more information, call 949-793-4044, or visit www.marowoodgrill.com.